Hartke HyDrive HX115 500 Watt Bass Cabinet - 1x15"
In this video from *Sweetwater Sound* "David Ellefson (Megadeth) and [Frank Bello](http://equipboard.com/pros/frank-bello) (Anthrax) explain why they choose Hartke bass amps and cabinets for their bass rigs." In this video from *Sweetwater Sound* "[David Ellefson](http://equipboard.com/pros/david-ellefson) (Megadeth) and Frank Bello (Anthrax) explain why they choose Hartke bass amps and cabinets for their bass rigs." Stuart Hamm uses a Hartke HyDrive HX115 cabinet, according to Hartke's [website](http://www.samsontech.com/artists/stu-hamm/). For The Winery Dogs' 2015 tour, Sheehan is running his Hartke LH1000s into 3 of these 1X15 cabinets, and also carries 2 spares. "I was totally surprised and blown away by the new Hartke HyDrive cabinets. I choose to endorse this company and have been using them now since the beginning of 2008. I usually use two 4x10 and two 1x15 speaker cabinets." No reviews or videos yet for Hartke HyDrive HX115 500 Watt Bass Cabinet - 1x15". With an Equipboard account you can rate this item, add it to your collection, submit a review to discuss what you like and dislike about it, and associate Hartke HyDrive HX115 500 Watt Bass Cabinet - 1x15" to artists that use it. Create an account! 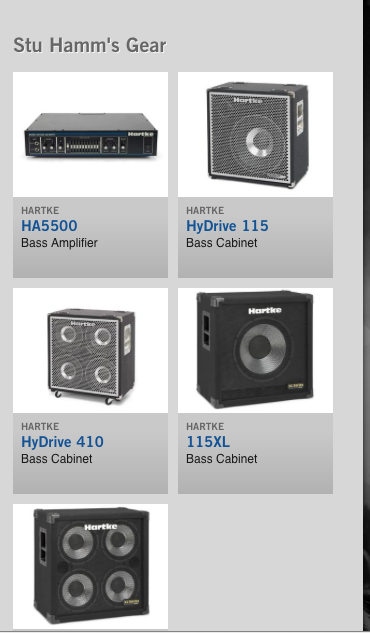 See Who Uses Hartke HyDrive HX115 500 Watt Bass Cabinet - 1x15"